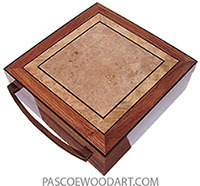 This box is made of thick camphor burl veneer laminated over aspen and altogether uses 7 different kinds of wood. 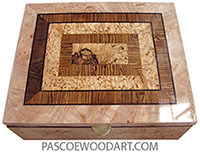 The top centerpiece is redwood burl framed in masur birch with ebony and satinwood stringing. It is finished in high gloss varnish. 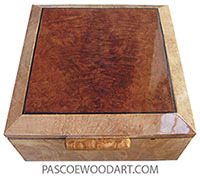 Box and tray bottoms are lined with burgundy velvet. Top tray slides across the width. Last updated November 15, 2011. Posted October 08, 2011.